Last Tuesday the Tuesday Nighter's crew visited. I did receive some positive encouragement as to the progress thus far achieved. As promised last update, below is the photo on the area just past the Rocla Siding north of Grafton Yard heading towards Rappville loop and onto Cassino. The bridge was scratch built by me about two years ago now at the Brisbane Model Railway Exhibition in May. The house is a Jim Hutchinson gift and the windmill is a brass model I purchased quite some years ago. Of course when this area is complete there will be fencing, driveways, sheds, cattle, railway access roads, a bit of greenery and a tree or two. I also started working on a tunnel mouth near of the Running Creek Tunnels. This location is between Border Loop and the Risk Crossing Loop. Only a few hours ago a decided to try and put some scenery in near Cassino. For quite some time, I have had some rather course chicken wire forming some base scenery outline. So I covered this with paper towel and then plaster soaked tissues. This is the Barker Street pedestrian crossing area that I intend to model. Left out of sight (to the south) is the Richmond River Bridge, while right (and north) is the Railway Avenue overbridge at Cassino. The balsa wood is the what will become the bitumen road of Barker Street. I use a black/grey stain to achieve this. 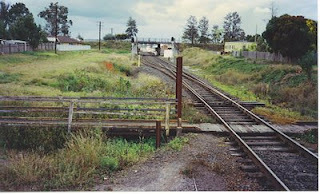 Below is a photo taken at this walkway many years ago looking south towards the Richmond River Bridge. If you look north you see the overbridge. This walkway is now closed. Well it has been such a long time since I have posted that I thought I should bring followers up to date with what has occured. I don't have any photos this time, just a verbal update to keep you interested. I guess you will just have to keep wondering what it looks like until I post some shots. From what I have already posted you have only seen an empty shed and the outside. The last week I had a week off work and completed the garden outside the shed. It's only been three years. I moved 2 cubic metres of soil into the gardens and laid a few pavers for the garden edge and a few more lock blocks at the other right hand side of the shed (as you look out the door) to complete the retaining wall. 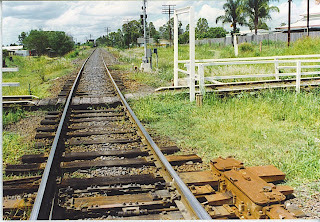 I have completed the point work into Acacia Ridge Yard to allow access to the staging tracks, I just need another 10 lengths of flexitrack (2 weeks time) and another 3 sets of point for exiting the staging tracks in the yard and the 4 complete loops will be finished. This will allow for at least 12 trains to be staged here. I then have a number of dead end tracks to work on over the rest of the year. I have put up a whole lot more layout facia, about 12 linear metres -actually. I have also ordered a sound equipped CPH - got an ETA Werris? I have also talked the financial controller into letting me upgrade my NCE SB3 into a PH-Pro 5 amp system - although by the time I go to purchase it she will have forgotten about this. This will allow the next running session (Easter Saturday) to have more than 4 operators in attendance. Four people can get lost on my layout! I need at least 6 operators I'd guess and then at least one extra person operating the yards (Grafton and Acacia Ridge) as they are above each other. This person will be just shuffling up trains in the loops after one train leaves and making room for arrivals, and putting the correct motive power on a train. At the moment what is on a train stays on a train forever. I do plan to vary this with each session eventually. I also spent time, this last weekend, contouring the first section of baseboard from Grafton yard around the first spiral with styrofoam and then laying plaster over the top. I need to add another coat of plaster soaked tissues and then I can paint this area and then scenic it with tile grouts and other items like real rocks and dirt and various sands. I was hoping to make this little project complete before the next Tuesday Nighters at my place, which could be in 8 days time or 2 weeks after that (I'm not sure we made a decision where the next meeting will be on last Tuesday night!). So I would really like to refrain from posting a picture until this section is complete and surprise the Tuesday Nighters - two of them are following this blog. I was also hoping to publish some video on this blog of a train travelling the layout - so stay tuned for that. You will need about 18-20 minutes to follow the train from one end to the other, but i'd post then in crossing loop to crossing loop scenes.